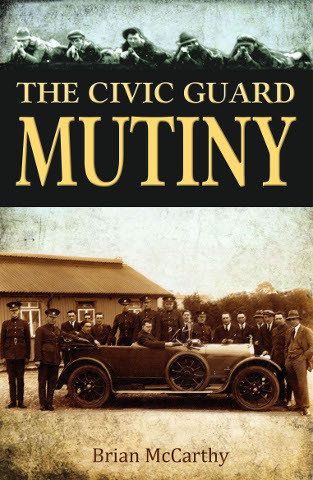 The Civic Guard Mutiny by Brian McCarthy deals with an incredible incident that’s almost completely overlooked in the history of the Irish Civil War. On the 15th of May 1922 over 1,200 recruits of the newly established policing service of the Irish Free State broke ranks during the commissioner’s address in Kildare Barracks, raided the armoury and held the barracks under their control. The commissioner and some of his senior officers had to withdraw under armed guard while for the next seven weeks the Provisional Government and the mutineers negotiated about bringing the Civic Guard back under government control. So in a period where the Irish Republican Army and Sinn Féin had split over the Anglo – Irish Treaty, and the country was edging towards a bitter and bloody civil war, how did the Provisional Government lose control of their new police force? The answer lies in Ireland’s long and at times acrimonious relationship with policing. McCarthy details the history of policing in Ireland from the Norman Invasion in 1169 but it is the immediate predecessor of the Gardaí, the Royal Irish Constabulary, and the relationship between the new recruits in the Civic Guard and the RIC that form the bulk of the book. The Royal Irish Constabulary was popularly associated with putting down the Fenian and Land League movements. In 1867 Queen Victoria had bestowed the Irish Constabulary with the prefix Royal in recognition of their zeal in crushing the Fenian Rebellion and from its inception it was a police force unlike any other in the rest of the United Kingdom. The RIC covered thirty-one of Ireland’s thirty-two counties while the Dublin Metropolitan Police handled policing in Dublin. The RIC was an armed police force which was heavily involved in the gathering of political intelligence. It never enjoyed the same level of public acceptance as the unarmed DMP and its role in evictions during the Land War, and its emphasis on political policing, meant that large sections of the population viewed it as an occupying force rather than a police service. The intense training regime for the recruits at the Phoenix Park Depot in Dublin became a model for colonial police forces throughout the world with many high-ranking members of the RIC taking up leadership role throughout the colonies. While the higher ranks of the RIC were Protestant and Unionist the vast bulk of the force was made up of Catholics. With the cessation of the Land War and the death of Parnell the public perception of the RIC improved as the police were no longer faced with the hostility of a united nationalist movement. The visit of Queen Victoria in 1900 reinforced the idea that Ireland had entered a period of domestic tranquillity and the successful security arrangements for the visit earned each member of the force a special medal. As the political nationalist movement fractured and declined what was known as the cultural nationalist movement began to grow. Various language, sporting and cultural bodies sprung up and they attracted many members whose nationalism was more radical than the mainstream political movement of the day. The Gaelic Athletic Association, for example, enacted rules prevented any member of the RIC or DMP from being a member of the organisation. Increased public hostility to the police was matched by a growth in political separatism. Sinn Féin won a series of stunning by – election victories in 1917 and the general election in December of 1918 saw Sinn Féin win 73 out of 108 Irish seats in the House of Commons, dominating the vote throughout the country apart from north-east Ulster. Rather than taking their seats in the House of Commons in London, the Sinn Féin TD’s established their own legislature at the Mansion House in Dublin known as Dáil Éireann. At the same time as this inaugural session was happening in Dublin, members of the IRA in Tipperary ambushed two RIC constables who were transporting gelignite and shot them dead, an event that is largely accepted as the start of the War of Independence. Policemen were ostracised and boycotted in their local communities and violence against the police saw a wave of resignations. The government responded by recruiting demobilised soldiers in Britain into the RIC who then became known as the Black and Tans due to their combination of RIC uniforms and army khakis due to a shortage of full police uniforms. In June 1920 General H.H. Tudor was appointed Chief of Police in Ireland and shortly after his appointment he established the Auxiliary Division of the RIC, made up of former British Army officers. The Auxiliaries were to earn an even more fearsome reputation among the Irish people than the notorious Black and Tans. Ambushes against the Crown forces and attacks on RIC barracks by the IRA led to indiscriminate reprisals against the civilian population which further alienated the majority of Irish people against British rule in Ireland. As the RIC withdrew to heavily fortified barracks throughout the country it became impossible for the RIC to police ‘ordinary’ crime. The Dáil responded by setting up a parallel system of law and order including courts and an Irish Republican Police force although many IRA leaders considered the Republican Police to be a waste of manpower and a distraction while the war was on-going. In July 1921 a truce was declared between the British government and DáilÉireann and it was agreed that for the duration of the truce the RIC and IRP would co – exist and co-operate with Michael Staines and EoinO’Duffy acting as liaison officers on behalf of the Dáil. Following Dáil Éireann’s acceptance of the Anglo – Irish Treaty in January 1921 a Provisional Government was created for the new Irish Free State with Michael Collins as chairman. In February 1922 the Minister for Home Affairs, Éamonn Duggan (the son of an RIC man himself), began arrangements for the formation of a new policing service to replace the RIC in the twenty – six counties. A committee was formed and two appointments by Collins were to prove hugely controversial and sow the seeds for the mutiny which was to take place later, RIC District Inspectors Patrick Walsh and John Kearney. Michael Staines (another son of an RIC man) chaired the committee and was appointed first Commissioner of the new Civic Guards. McCarthy’s book takes us in detail into the many difficult issues facing the Provisional Government in trying to create a new police force in the midst of political turmoil and ,with a Civil War only months away, in a new state where law and order has almost completely broken down. The Provisional Government sought new recruits from among the ranks of the pro – Treaty IRA but they failed to recognise the depths of the hatred most IRA men, both pro and anti- Treaty, had for the RIC, far more in fact than they had for the British Army. By relying to a large extent on former RIC members to train the new service and to model the new force in many aspects on their predecessor they were storing up trouble for the future. Many of the new recruits refused to salute their training officers who had previously served in the RIC. The Civic Guard Mutiny is a fascinating book and an essential read for anyone interested in the Civil War. McCarthy take us step by step through the myriad of problems the Guards faced during their training process in the RDS, the point where the mutiny breaks out in Kildare Barracks on the 15th May 1922 and the Provisional Government’s attempts to bring the force back under civilian control. The most interesting part of the story is the intrigue among senior members of the Guards, some of whom were manipulating the mutineers for their own ends, and also the fact that the anti – Treaty IRA has secretly sent recruits into the Guards to destabilise the force from the beginning. After much negotiation between the mutineers and the government a commission of inquiry was instituted under Kevin O’Shiel and Michael McAuliffe. The commission was to recommend disbanding the Civic Guard with selective re-enrolment of current men. Michael Staines resigned as Commissioner and was replaced by General Eoin O’Duffy. O’Duffy was to spend almost the next decade in that role and moulded the Garda Síochaná into the force we know today. The Civic Guard Mutiny is a very welcome addition to the historiography of the Civil War and well worth a read. Written by: Cathal Brennan on 28 April, 2013. Last revised by: John_Dorney15 May, 2013. 3 Responses to "Book Review – The Civic Guard Mutiny"
Exactly as it happened and proven. There were many ex RIC went into the Guards. Others lived good lives afterwards. The RUC wouldn’t have really any for they upset the sectarian dominated ratio. Who were Michael Collins men in Dublin Castle ,but RIC. Those condemning the RIC are also doing similar to 2 1916 executed and plenty other volunteer`s families. An excellent addition to the history of the period, concerning an episode which is probably little know about. The fact that it happened during the period following the signing of the treaty and before the outbreak of Civil War provides a fascinating glimpse into a time when Irish history might have turned out very differently. The history of the mutiny is well told, particularly the pictures that emerge of key figures in the Provisional Government and the higher ranks of the Civic Guard. It is hard to believe at this remove that such an event ever took place, but it did, and it served to shape the Garda Siochana for the next fifty years, for better and worse. It took the Conroy Commission of 1970 to finally dispense with some of the last vestiges of the strict RIC code and its quasi military ethos. At the start of the book, the author provides a quick gallop through Irish history, leading up to Independence. While it is probably superfluous for informed readers, it really is about the best potted history of Ireland that I’ve read and will certainly arm anyone who is not familiar with events over this long period with information to understand the events that follow.